Focus Foodservice LLC is committed to providing the foodservice industry with products and services that provide exceptional value and create operational efficiency. Our team of foodservice professionals works to provide solutions in the foodservice industry. Our Focus Foodservice commercial bakeware pans are manufactured to meet the exacting standards of the toughest commercial bakeries and foodservice establishments. Each pan is crafted from heavy-gauge aluminized steel, a 3 ply material consisting of two layers of tough corrosion resistant 3003 aluminum alloy around the durability, strength and superior heat conduction of carbon steel. The frame is constructed with a heavy reinforcing rod to keep the pan from warping during baking. 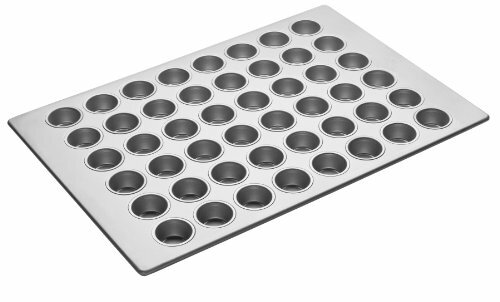 These Focus bakeware mini-muffin pans are offered with a silicone coating that provides easy release of baked products.